P.J. 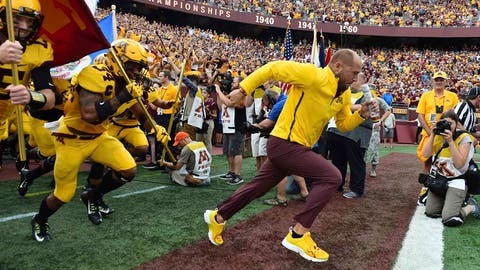 Fleck, donning a pair of Goldy Gopher shoes, leads his team to the sideline before the game. 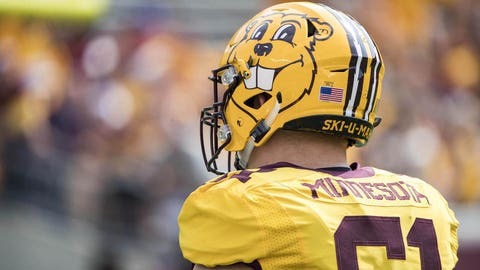 Offensive lineman Bronson Dovich wears the new Goldy Gopher helmet before Saturday's matchup with Middle Tennessee State. 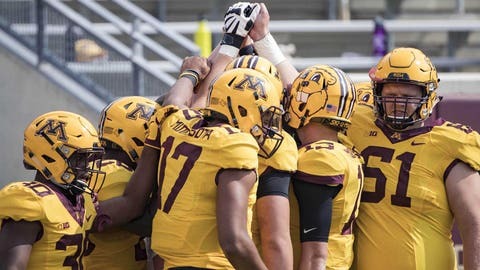 A group of Minnesota Gophers huddle up in their all-gold uniforms. 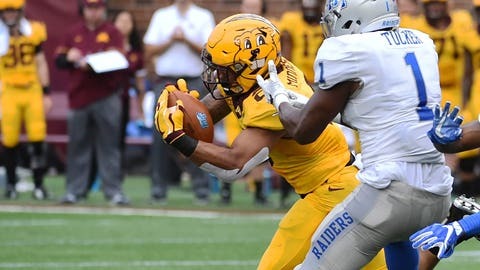 Minnesota Gophers linebacker Blake Cashman makes a tackle for no gain in the first quarter. 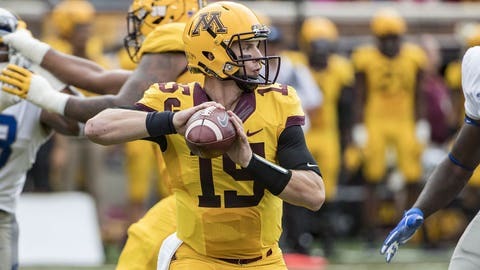 Conor Rhoda fires a pass in the first half for the Minnesota Gophers. 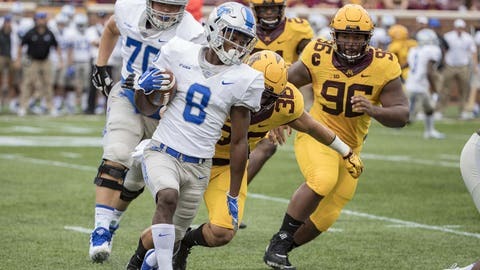 Minnesota defensive back Jacob Huff intercept a pass intended to Middle Tennessee Blue Raiders running back Shane Tucker and returns it for a touchdown. 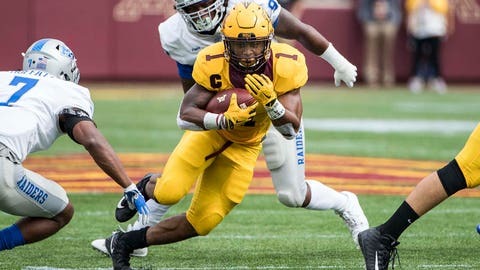 Minnesota Gophers running back Rodney Smith finds a hole during a first-half rush against Middle Tennessee State. 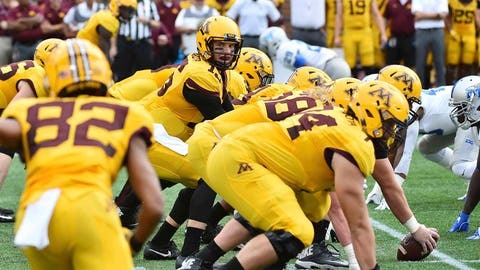 Conor Rhoda barks signals to his Minnesota Gophers offense. 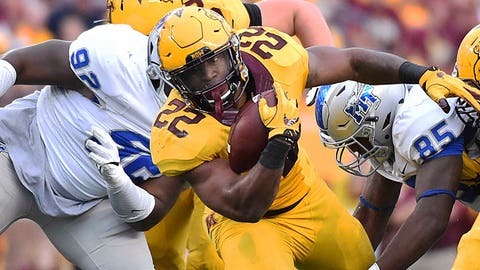 Running back Kobe McCrary finished the game with 23 carries for 107 yards and three touchdowns. 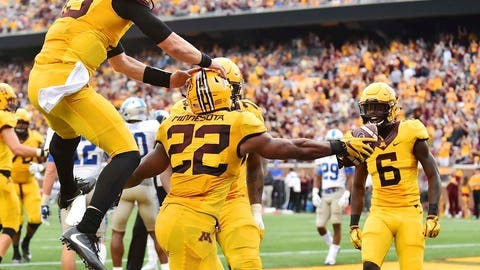 Minnesota running back Kobe McCrary is congratulated by teammates after scoring on a 5-yard touchdown.